This petition has been created by Alicia Ní G. and may not represent the views of the Avaaz community. Irish planning authorities look set to approve the construction of a plastics factory without requiring an independent environmental impact assessment thereby threatening a wealth of local eco-businesses, the health of the community at large and the integrity of the untouched, pristine landscape of West Cork, two miles from marine conservation site, Lough Hyne. Globally, we shouldn’t be creating more plastic. We need to be innovating it out of our production cycles. Please sign and share this petition widely to ask Irish politicians to consider the future role of these developments on a national level, economically and environmentally, and help us make a small local stand in the interest of a healthier, circular global economy for our children. PLANS TO BUILD INDUSTRIAL PLASTICS FACTORY ON GREEN BELT LAND IN STUNNING WEST CORK WITH NO CONSIDERATION FOR ENVIRONMENTAL IMPACT? We have waited 6 months for a response from the Irish planning board, An Bord Pleanála (ABP), regarding their decision to allow RTP Company to erect a plastic nurdle factory on a former Green Belt site between Baltimore and Skibbereen, Co. Cork, Ireland. We are still waiting - but how did the application even get this far? Initially, RTP, an American company with global reach, approached the Industrial Development Authority (IDA) about their proposed development on untouched Green Belt allocated land. It appears the IDA advised Cork County Council to rezone the land and it seems they in turn advised local councillors. Local council voted for the re-zoning of the land but were perhaps not aware of the nature of the development. As unthinkable as it is, RTP were given permission to build on this former Green Belt land without a Strategic Environmental Impact Assessment or Habitats Directive Assessment. Permission was also granted completely under the radar of public knowledge; the only notification regarding the planning application was retrospectively unearthed in the form of a small newspaper advert that the bulk of the local community did not even see. We don’t know for sure how informed government was to the nature of the factory in advance of this re-zoning decision. What we do know is that RTP propose to build a Thermoplastics Compound Facility where they will make plastic nurdles, small plastic pellets measuring 5 mm in length. These are melted down and reconstituted with added properties like fire retardants before being shipped back out again. A report commissioned by environmental charity, Fidra in 2016 estimates that up to 53 billion nurdles may be spilled each year from land-based sources in the UK alone. That’s the equivalent of losing up to 88 million plastic bottles to sea over the course of a year. The current desire to rid our oceans of plastic looks mostly at large scale plastics pollution but a plastic bottle takes years to break down. On the other hand, we know that microplastics are consumed and known to be eaten by a host of fish and seabirds, as they can be mistaken for fish eggs. WHAT ABOUT THE AARHUS CONVENTION? Under EU regulation, all planning decisions are subject to environmental assessments and must involve proper public consultation. However, in this case, it appears the council assessed the requirement for both and decided neither assessment was necessary. Unbelievably, the public were not notified about the decision to re-zone the land, or the decision not to carry out these assessments, or the fact that a company with waste water discharge would potentially be built in the vicinity of two Special Areas of Conservation; Lough Hyne, which is not only the first ever Marine Reserve in the EU, but is arguably one of the most beautiful places in the world, and Roaring Water Bay & Islands; areas of such stunning places of natural beauty that tourists come in their droves to swim, sail and walk year round. The Baltimore/Skibbereen region’s economic well-being is not dependent on inward industrial investment of this kind and we have so much to lose should planning permission be awarded. Skibbereen is host to a first class digital and tech hub in the form of Ludgate, which is at the forefront of nurturing sustainable business models for the longevity and success of its start-ups, the community, and for the future of jobs creation in the area. Furthermore, Baltimore, Skibbereen and the West Cork region at large is home to one of the biggest tourist and food industries in the country, which are integral to the growth and success of the Wild Atlantic Way - a government led initiative that has cost 40 million euro in the way of promotion so far. Yet, government voted to have Wild Atlantic Way land rezoned for a plastics factory that promised a mere handful of jobs and that has the spectre of 10 to 20 truck loads of plastic coming through the locale daily via our narrow country roads. 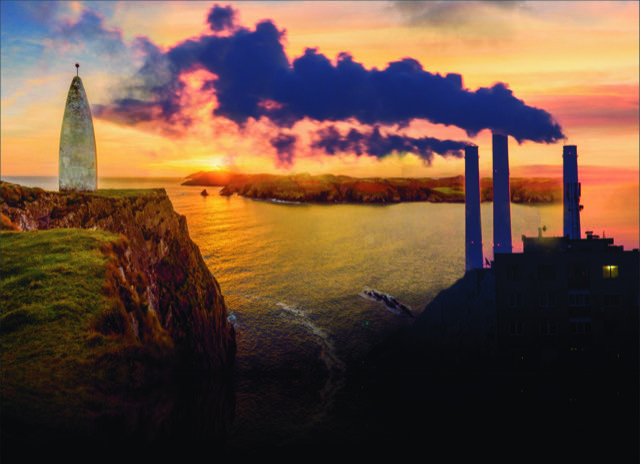 This factory will be open 24 hours a day and will erect 4 chimneys measuring 17 metres in height. ‘JOBS!’ IS THE ARGUMENT IN FAVOUR OF THE FACTORY BUT WHAT JOBS? Firstly, RTP is a privately owned company who may well benefit from grants and IDA assistance for the first few years of business. RTP has 19 production plants in 7 countries and makes over $1 billion in annual revenue. We don’t know the full benefit of the Irish Corporate Tax environment for a company like RTP or how their subsidiaries will be incorporated into this Irish entity. Regarding jobs for Skibbereen locals, RTP promise 50 jobs to the area but their latest plastics factory, erected in Poland 2017, a much larger build, is only home to 25 employees. Even if 50 jobs were to be created, let’s look at the cost of these jobs to existing local businesses, jobs and the environment. What about the thriving fish and shellfish industry? The mussel industry alone in Roaring Water Bay, Baltimore, is home to 70 employees and contributes 1.7 million euros to the local economy every year. Mussels by nature are filters for pollutants like metals and plastics. If such elements/ pollutants are traced during regular, mandatory testing, the mussel industry here will be destroyed. There are also hundreds of other jobs generated by our food, farming, restaurant, hotel and tourist industries. West Cork is home to two Michelin star restaurants, one located in Baltimore and the other in Ballydehob, whose success to date is largely predicated on the use of ethically sourced, local, seasonal ingredients. The region is also home to a vast number of other award winning restaurants who proudly devote their respective philosophies to the use of local, seasonal and sustainable food, grown widely in the area by local farmers on land and sea. These renowned restaurants employ a significant number of employees and attract tourists as destination restaurants both seasonally and year round. Should our food sources become contaminated, we stand to lose our massive tourist populations who, not only visit our destination restaurants, but also our landmarks, coastline and conservation areas such as marine conservation site, Lough Hyne, situated only two miles away from the proposed site! WHY NO ENVIRONMENTAL IMPACT ASSESSMENT? It seems that local council and Cork County Council went on the advice of an environmental consultant employed directly by RTP who simply ruled out the need for an environmental impact assessment. This was good enough for council but will it be good enough for The Irish Planning Board? It can’t be good enough for the Irish Government or the people of Ireland going forward. We as a nation have a huge responsibility to step up and improve our efforts to tackle climate change like our European partners. Planners in this country are currently making environmental decisions with no clue about the impact on ecology. When they have to, they rely on the advice of ecological consultants who are employed by the developer. It’s high time local and county councils all over the nation employed independent ecologists directly so that our authorities are able to challenge the developer’s consultants going forward. It’s almost 2019 and it’s time to call on our politicians to implement, in law, the necessity for INDEPENDENT AND UNBIASED ASSESSMENTS before the next small factory or large corporation applies for planning permission, without considering the potentially devastating effects they may have on the environment. If we are ever to hope for some semblance of democratic planning in this country, this is the least we can ask for; honest assessments that look at the real cost to our waterways and our food sources from an educated and independent point of view. RTP’S application does not deal with water pollution because this issue falls on the shoulders of Irish Water. There is no specific documentation put in place on how the factory waste will be treated, therefore the possibility of heavy metals, toxins and microplastics going straight into the River Ilen is very high. Nothing was requested by the Environmental Protection Agency (EPA) because RTP told them they would not exceed any thresholds that would trigger further reports, studies or a requirement for an Integrated Pollution License. Without mandatory, independent assessment by an ecologist, what stops other companies like RTP getting more Green Belt land rezoned for the purposes of expansion? PLASTICS FACTORY IN RURAL PARADISE IN 2020? In recent years we have been bombarded by images, documentary films and the results of a multitude of unbiased studies carried out in order to assess and review the state of our oceans and the impact the production of plastic has on marine life. We don’t need to compile a list of reasons why plastics are bad for the environment for the purposes of this petition, never mind the chimney emissions or how well-equipped our water treatment centre is to deal with inevitable plastic nurdle run-off. We know the factory will not be good for our surroundings or the families who dwell a mere 400 metres from the proposed site. If we don’t stop it being easy for such global industries to demand planning permission for their factories in such famously beautiful areas like West Cork; a relatively untouched area with clean air and water, we will forever be powerless to solving our international environmental crisis. If we lose these sacred spots, we lose everything we have. This is more than just a local issue or an Irish one; this is an international problem. If we, the people, don’t have a say, we will forever remain powerless to stop such extraneous infrastructure in our localities and cities. This plastics factory is only one example of development dominating over environment concerns in this country. With international support, we can get the Irish government to take notice and enforce the implementation of independent environmental assessments so the rezoning of land for the purposes of harmful plastics production, or other environmentally harmful production, NEVER HAPPENS AGAIN. We can’t do anything but wait about the Planning Board’s impending decision right now but we can ensure that local government will never authorise planning permission/ re-zone green-belt lands again without unbiased assessment. Without this insurance, we as Irish people don’t stand a chance of protecting our precious natural environment, or of living in a country which stands FOR the importance of democratic planning and AGAINST decision making taking place behind closed doors. The future role of these developments should be a political issue and one we need to tackle now, together. While the final decision is being ratified by the board, we ask for the support of the Irish community and the international community in pulling together all the signatures we can with a view to making permanent change to current planning requirements, procedures and related laws for good. Ireland are sadly ranked the second worst European country for tackling climate change. Poland, home of the latest RTP development, is ranked the worst. Is this what we want for West Cork, for Ireland, for Europe for our world? If not, please sign, share and show your support.